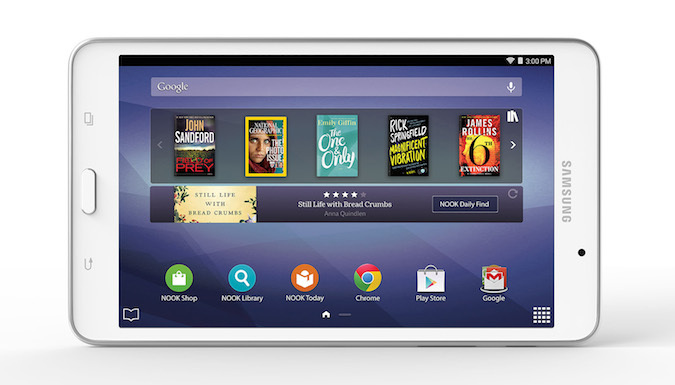 The Samsung Galaxy Tab 4 Nook is a tablet geared towards reading and it’s the first time Barnes and Noble outsourced the hardware design to another company. The end result is a Samsung branded tablet coinciding with the Nook ecosystem. A new device comes with a host of potential problems and it’s important to maintain it, in order to get a few years’ worth of usage. Barnes and Noble has been making e-readers since 2009 and tablets since late 2010. It is important to note that a tablet and e-ink based reader are fundamentally different. E-Readers are about as close as you can get to a print book and tablets tend to be multipurpose. The Samsung Galaxy Tab 4 Nook is running Android 4.4 and updates come out once in a while when new features are introduced. The stock apps from Samsung and Nook need updated periodically, as you undoubtedly know. Updates to stock apps like these increase the functionality and often security of a device while also streamlining the experience and cutting down on processing requirements. It’s possible to set your NOOK to update apps automatically, but Android Central recommends leaving this function manual in order to allow you to review possible permissions changes to your downloaded apps as time goes on. It’s an added security measure that could make a huge difference in keeping you safe online. Not updating automatically is important, because sometimes they are pushed out too early and end up causing serious problems. Just like your computer needs to be defragmented and you need to run a disk cleanup periodically, so too does the Samsung Galaxy NOOK need periodic system maintenance. According to Spicy Tricks, using a simple app like Master Cleaner to clear out app caches, temp files and other vestiges in the system not only helps keep an Android device from slowing down over time, it can actually speed it up to above “out of the box” speed with the right settings. Keep in mind that getting over-standard processing speed will take some work, and may not be possible depending on the apps you have downloaded, but keeping the system clean is the first step to at least maintaining the speed your device shipped with. If you’re aiming to get your new NOOK running as quickly as possible, you’ll want to keep the majority of your apps stored on external memory, namely a 16 to 32 GB micro SD card, and make sure that all files are saved externally as well. This reserves your internal memory for operating system, stock apps and system files, instead of bogging it down with a thousand books and the entire first season of Orphan Black. The real conundrum for many NOOK users is optimizing battery life. Since this is a mobile device, the first priority is to make sure that it will work away from home and a plug outlet for as long as possible. According to CNET, the standard battery life of a Galaxy Tab 4 ranges between 8 and 10 hours, but a few simple tips can offer you even more. Just this handful of simple tips could offer up to five extra hours of battery life for your NOOK. Keep in mind that the more complex the apps you run, the more battery life they’ll inevitably consume, so try to make sure that you don’t have too many power-hogs open at the same time. If possible, completely shut down apps as you finish with them instead of just switching to the next program in the lineup. Maintaining the system and operations of your NOOK may seem like the most important thing you can do to keep it running like new, but this doesn’t mean you can ignore physical care of your device. Keep it protected in a case or sleeve, use a screen protector as needed (anti-glare options work best), and try not to drop it. Like most tablets, this is a fairly sturdy piece of equipment, but that doesn’t mean it’s designed to survive a rough and tumble lifestyle. The rule of thumb is this: take good care of your Samsung NOOK, and it will provide hours of entertainment and convenience for years to come.